CRM Tools for Home-Based Agents | 8x8, Inc.
Is your company expanding and in need of more call center staff? Perhaps you're running out of on-site space and you've started considering up-hauling all your employees to a larger workspace. Whatever the case, you're looking for the best growth solutions. One option may be remote work for some of your staff, and you'll need an optimal call center team. Customer Relationship Management (CRM) call center software acts as a central hub for teams. It's an easy, smart way for businesses to connect with customers and build relationships while keeping track of and managing customer information. 8x8 offers CRM call center software solutions that are suitable for both small businesses and large enterprises, and the draw-card with this particular software is that you can pay as you go every month so that your spend grows at the same rate as your business. Because it's web-based, there are no complicated set-ups or updates required. All your home-based agents will need is a computer, internet access, and headphones. Call recording software is essential for a number of reasons, from the customer journey to helping agents improve their skills. Since home-based agents are not located on-site, it is especially vital to use this type of software in order to keep a finger on the pulse at all times. Call recording software can be purchased as a stand-alone, but with the 8x8 CRM call center software, call recordings are included, whether you're a small business or large corporation. A component of Automatic Call Distribution (ACD) software, skills-based routing software takes it one step further, by automatically routing calls to the best suited home-based agent to ensure an enhanced customer experience. This software eliminates the need for a physical person to answer calls and then route them. It also allows agents to become specialists in certain areas, helping individual employees to improve or increase their knowledge in one particular area. Skills-based routing software is usually purchased as part of CRM call center software or ACD software, but the function can be bought separately. TELUS International reports that customer satisfaction ratings drop by about 35-45 percent when a second call for the same issue is made by the user. In the same vein, for every 1 percent improvement in first-call resolutions (FCR), customer satisfaction increases by 1 percent too. Call conferencing software serves a major purpose: to speed up turnaround times by first contact resolutions. It encourages FCR by empowering agents to conference amongst each other to discuss solutions in order to find fast resolutions for an improved customer experience. This way, customers don't need to call in more than one time to get what they need. Interactive Voice Response (IVR) software is an automated telephony system that uses voice to assimilate data in order to route calls to the correct places. Customers often find IVRs annoying, but that can generally be eradicated by following some guidelines like setting up menus, allowing call back choices, and setting up good configuration options. Mostly, it's important for the person setting up the IVR to put themselves in the user's shoes in order to cancel out as many frustrations as possible. There are plenty of helpful guides around choosing the right system. 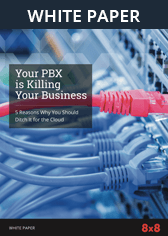 Your cloud provider and available features set directly affects your relationships with your clients, which directly affects your business' bottom line. Choose a superior cloud system and ensure that this effect is for the better. Fill out our online form today or call us at 1-866-879-8647 to request a no-obligation quote from an 8x8 Product Specialist.